Aggies wrap up fall camp, move into their week one. 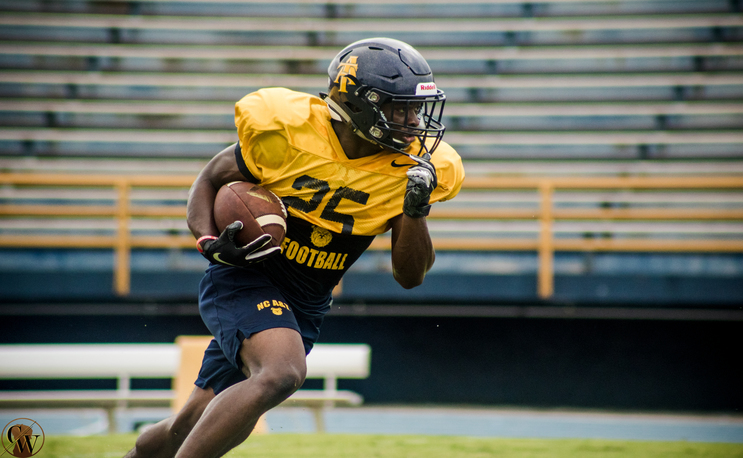 GREENSBORO, NC–Football camp is over and its all hands on deck for the North Carolina A&T Aggies. On Saturday the Aggies will take on non-conference opponent Jacksonville State in Montgomery, Alabama. Expectations are high for the Aggies. They are fresh off an undefeated season and with star players such as Lamar Raynard, Marquell Cartwright and Elijah Bell returning for the 2018-2019 season, NCAT is favored to win the MEAC once again. This past Saturday, the Aggies prepared with an early morning scrimmage, followed by the annual Funfest. They were introduced to fans young and old along with the other fall athletic teams. Fans of the Aggies had a great time, as they were able to talk to the players and receive autographed posters. The Blue and Gold Marching Machine also made an appearance, debuting new songs such as “Hardaway” by Derez Dashon and “Smile…” by Lil Duval (Which earned them a shoutout from the man himself). Check out some shots from the Funfest below.